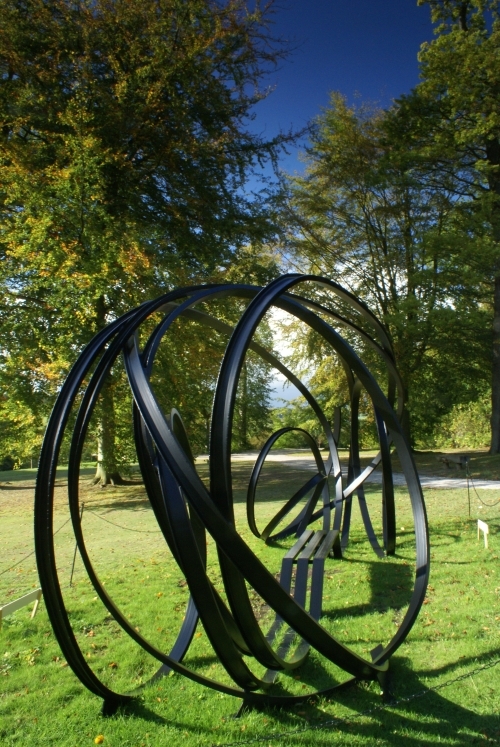 This year’s Beyond Limits sculpture exhibition opened on Friday September 16th, in the gardens of Chatsworth House. 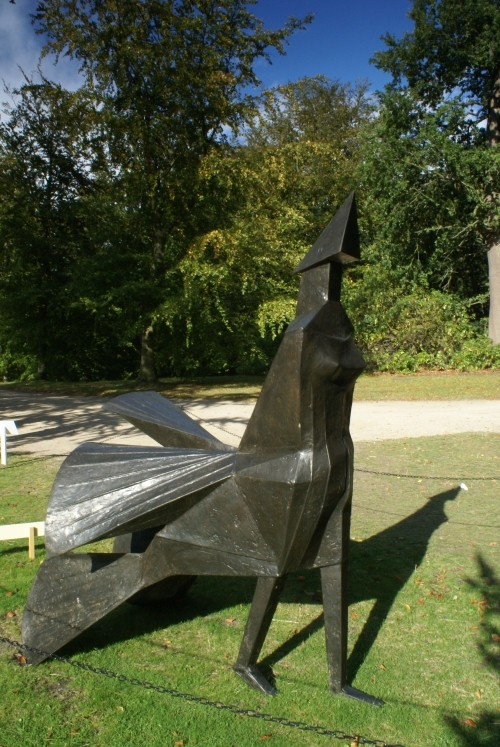 There are 26 works on display, including pieces by Damien Hirst, Rene Magritte, Lynn Chadwick and Marc Quinn, and the exhibition runs until October 30th 2011. The spot at the far end of the Canal pond is always reserved for something special. 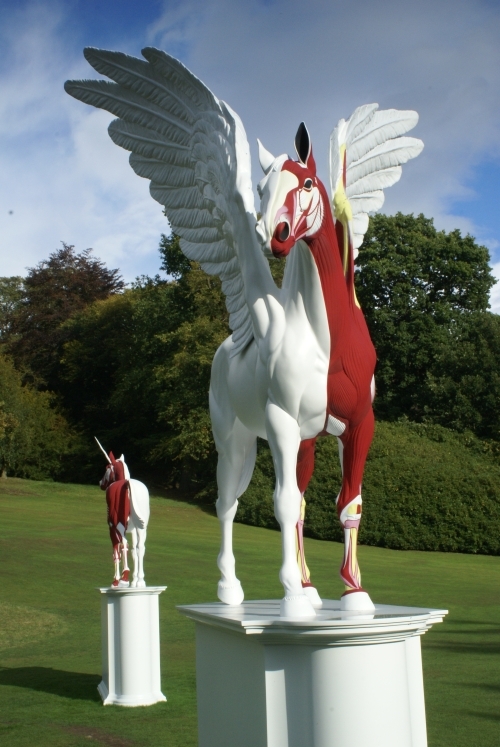 In previous years, we’ve had Marc Quinn’s statue of Kate Moss and a smaller version of Antony Gormley’s Angel of the North – and this year, Damien Hirst’s two painted bronze horses, Myth and Legend, looked spectacular in the afternoon sunlight. You’ll see Legend further down in this post. We first came across Takashi Murakami’s paintings on a trip to Boston in 2001. Since then, his designs have been used to adorn Louis Vuitton’s luxury luggage range – but this typically cheerful, cartoon-like sculpture also dates from ten years ago. 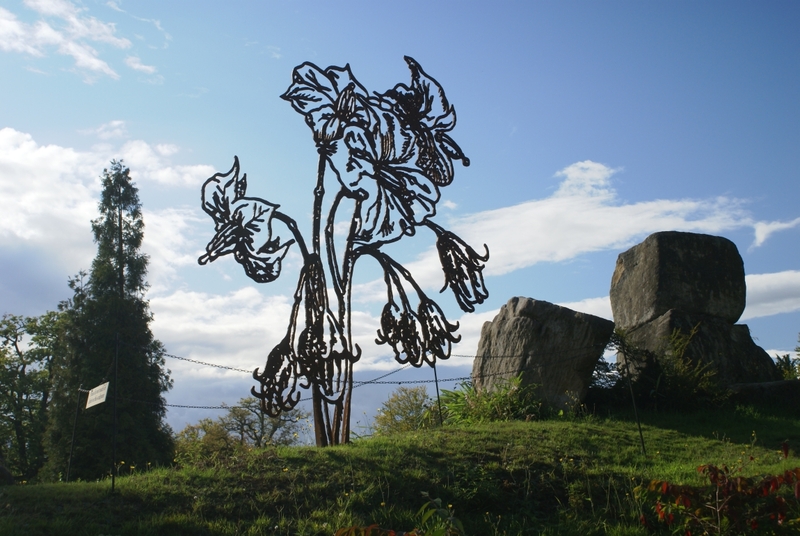 The first three sculptures on the trail were photographed during a heavy rain shower, which had the effect of dampening some of the cheerfulness of this work, casting it in a somewhat forlorn light, like an out-of-season attraction at a deserted seaside resort. 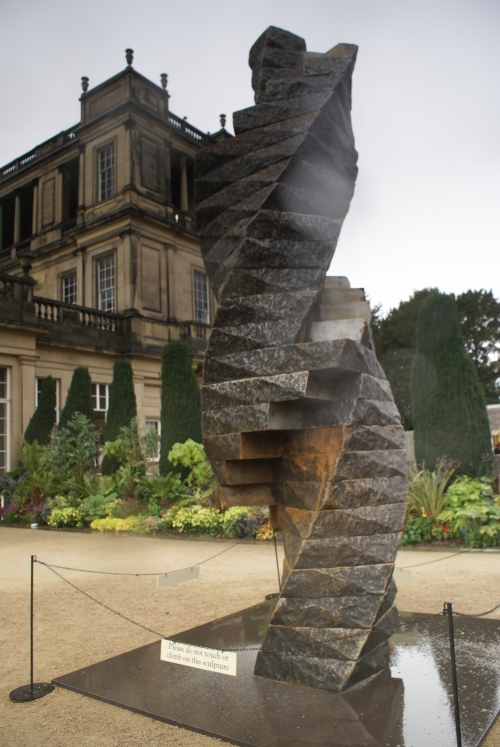 The spot nearest the Chatsworth House gift shop is usually given over to more geometrical pieces, such as this one. I wish we’d had more time to look at it, but the rain was pelting down and so we moved quickly on. 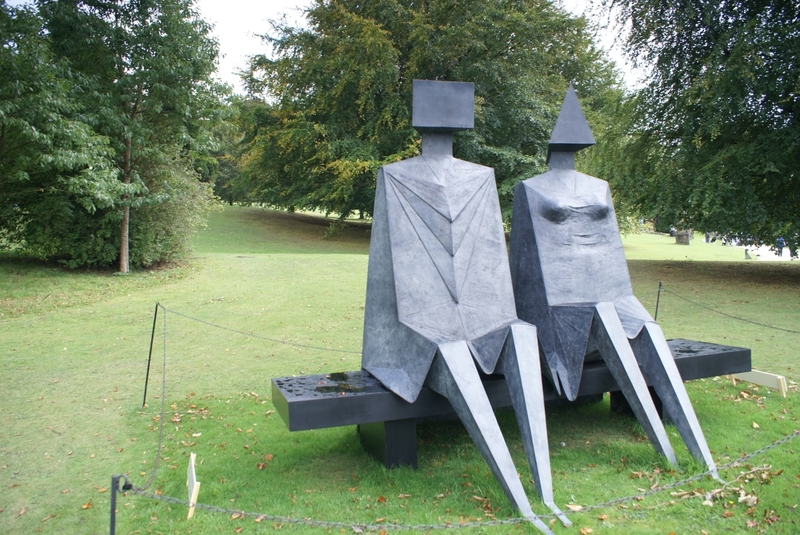 This is the first of three works by Lynn Chadwick in this year’s collection. 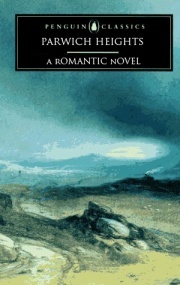 It rather looked as if the couple were being buffeted by the rain, sheltering under billowing plastic macs. 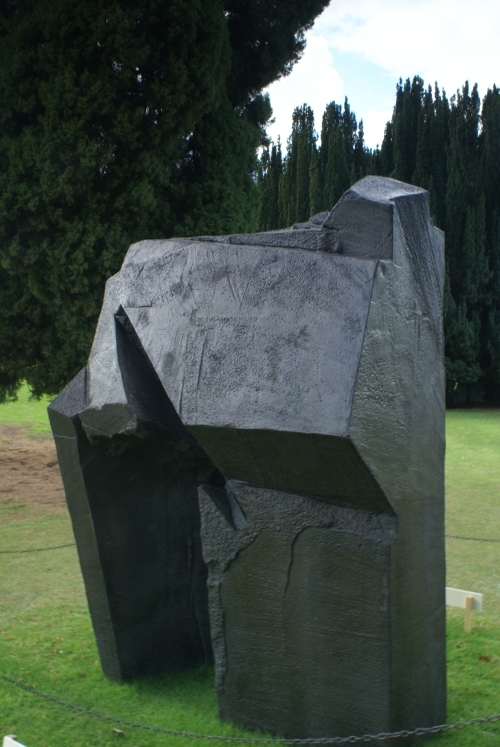 Ju Ming is another regular exhibitor at Beyond Limits, and this is the first of two works. The other is at Number 17 below. 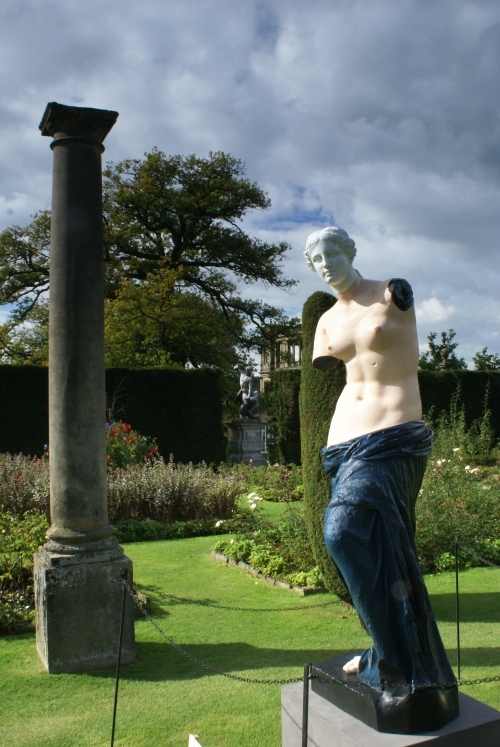 This is the French surrealist’s take on the Venus de Milo, painted in somewhat gaudy – or even tawdry? – colours. 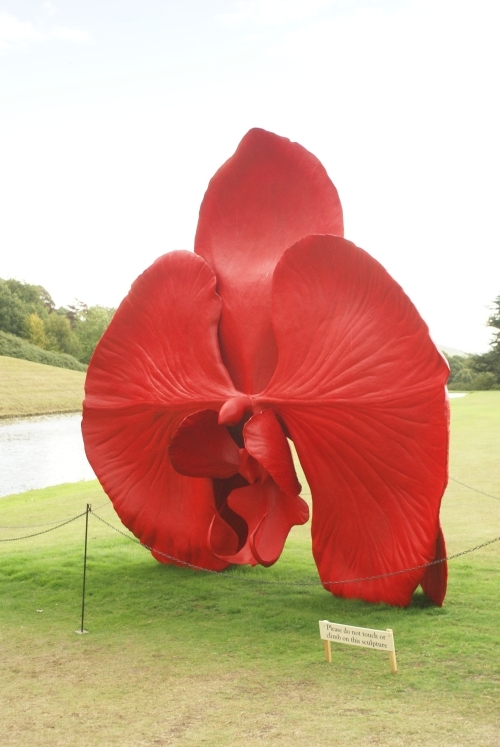 Nevertheless, it sat well in the rose garden area. 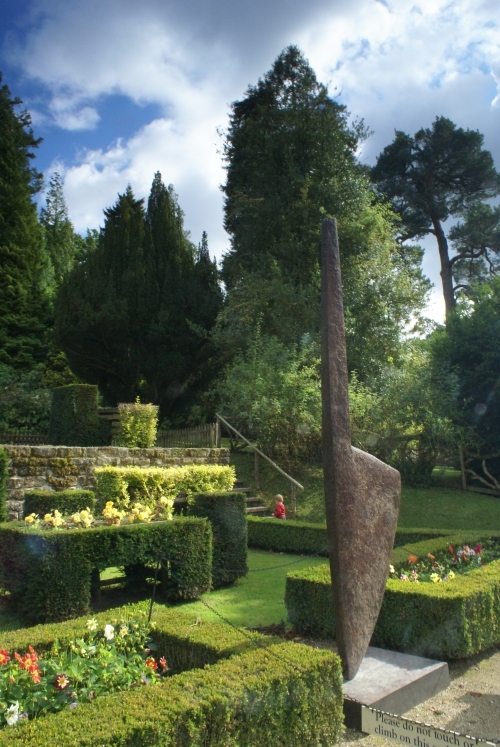 This work was placed in the cottage garden. 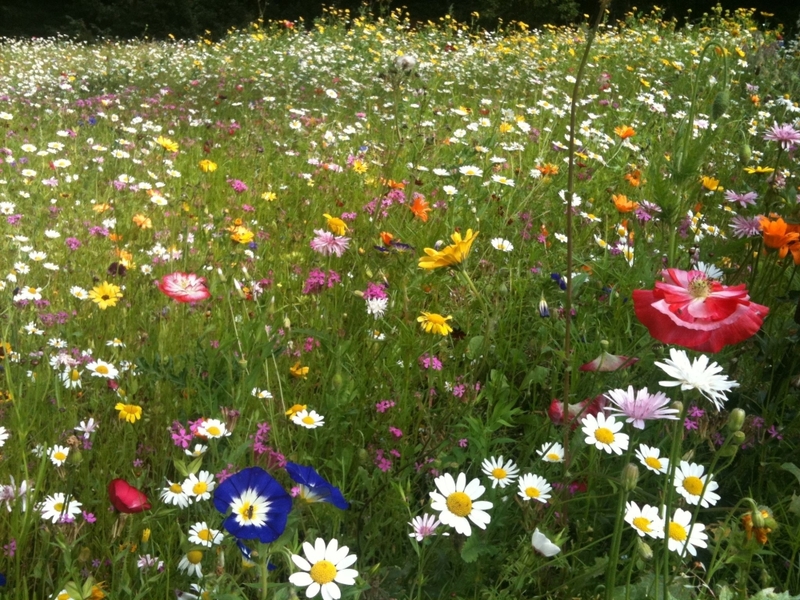 To its left, and a little further uphill, there was a beautiful and vibrantly coloured wild flower meadow – the first time we had seen such an area at Chatsworth – so we’ve added a shot of it, just below. 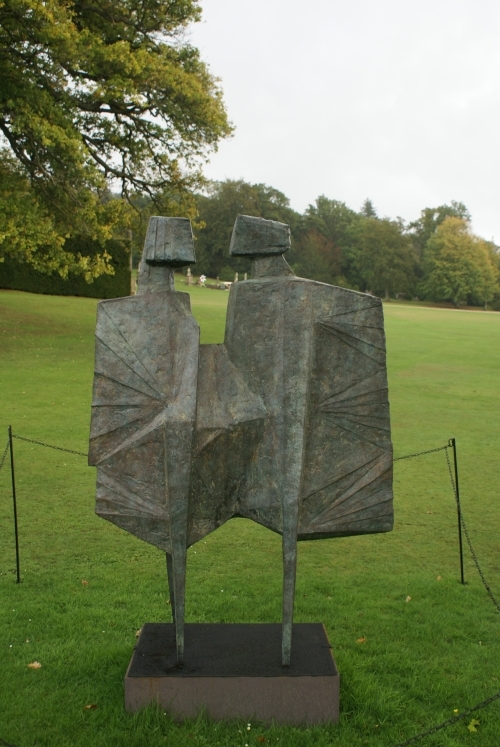 This looked very similar to one of Chadwick’s other sitting couples, which was displayed by the Ring pond in a previous year. 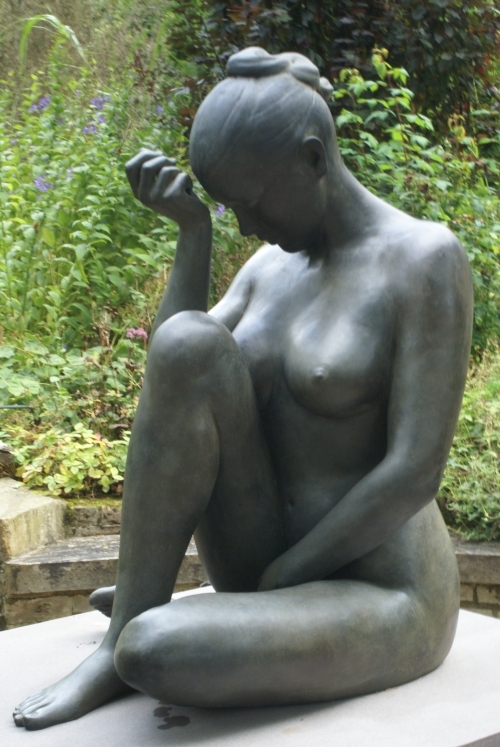 Sentire is the Italian word for “feel”: a fitting description for this lovely work, which is appropriately displayed in the Sensory garden. 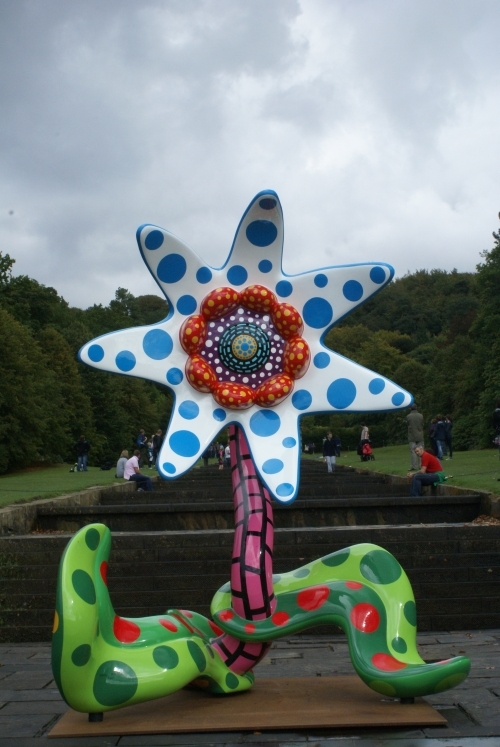 Situated at the foot of the Cascade, where crowds were gathering to watch the water being switched back on, this is another colourful, cartoon-like creation, which reminded us of Takashi Murakami’s work. 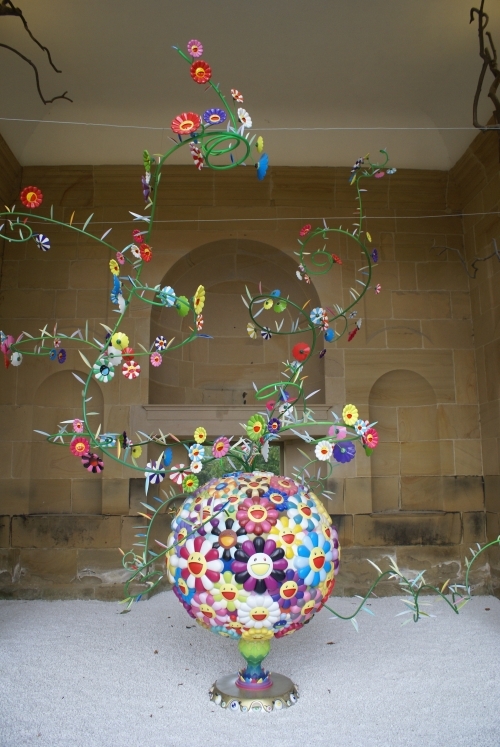 Zadok Ben-David is another Beyond Limits regular, who specialises in two-dimensional latticed renditions of natural forms. 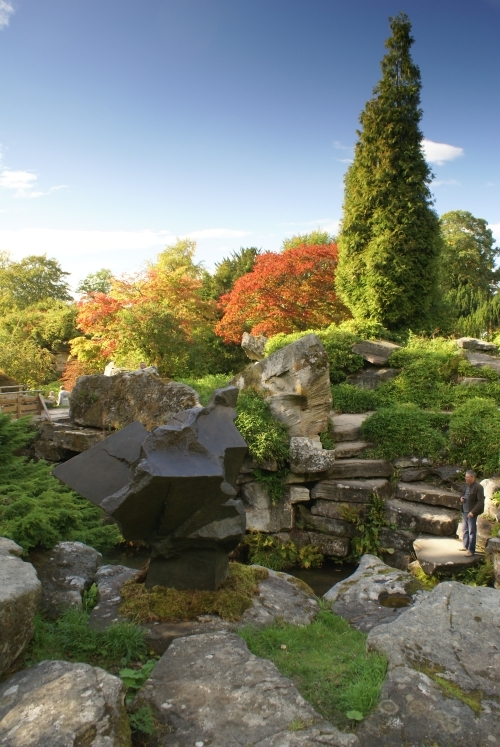 This also looked terrific when viewed from the summit of the rockery. Is “Miu” a reference to the noise that a cat makes? 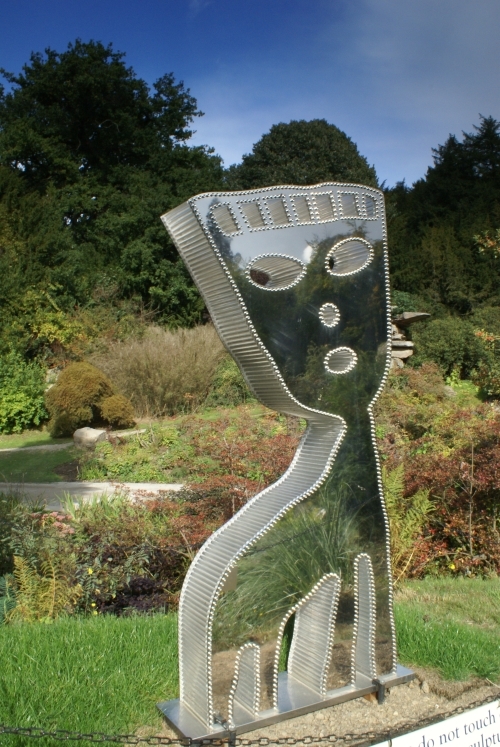 This piece had a clear, reflective surface, which looked great in the sunshine. 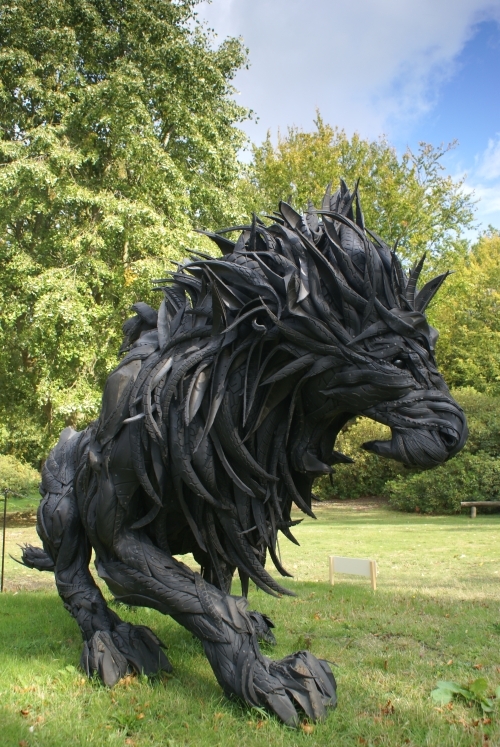 One of the most popular works in the exhibition, this lion was constructed from bronze and adorned with shredded car tyres. It reminded us of Japanese fantasy animations, and it looked startlingly alive. 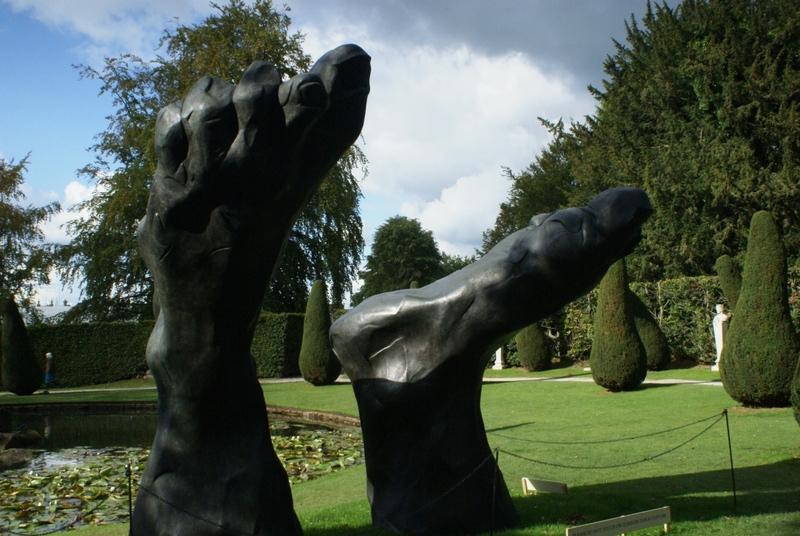 Placed next to the Ring Pond, this looked as if a giant had been buried head first in the ground, with only his huge feet left visible. 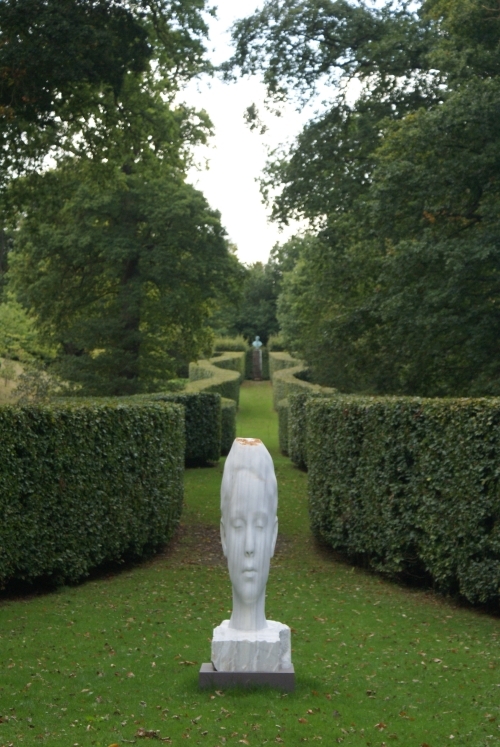 This enigmatic sculpture could only be viewed from a considerable distance, which added to its mystery. It almost looked like a stretched and distorted video still. This metallic piece had great sight lines, from all around the Strid pond. Presumably the frog’s extended tongue has been caught in the act of grabbing the hapless fly? 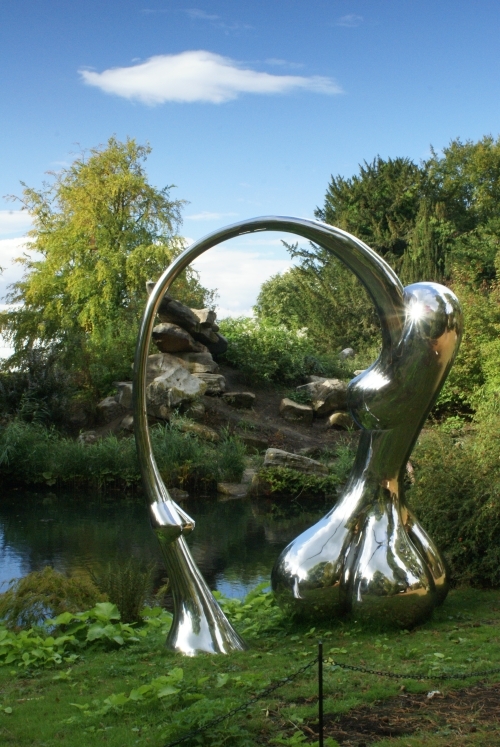 This was another piece whose reflective surface added another dimension to its appeal. Of all the works we saw, this was the piece which we most wanted to own. (The sculptures can all be bought from Sotheby’s, although it’s doubtful whether many of today’s visitors could have afforded them.) 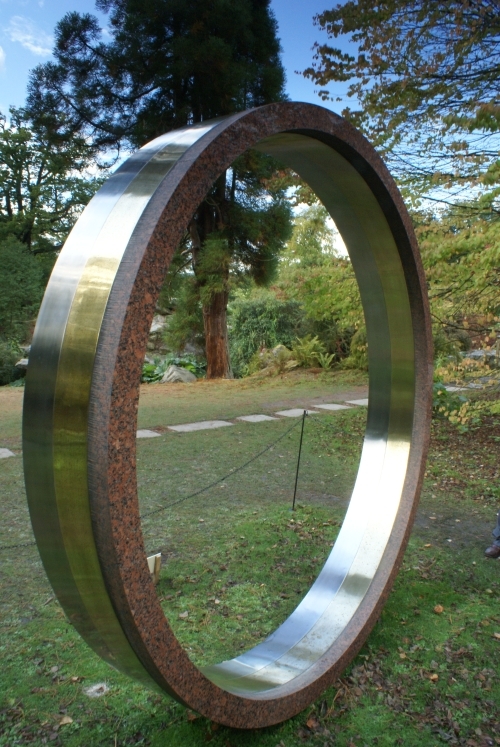 It’s a deceptively simple arrangement of granite, copper and stainless steel, which grows more fascinating as you walk around it, closely observing the changing dimensions and the way that the light affects the three different materials. 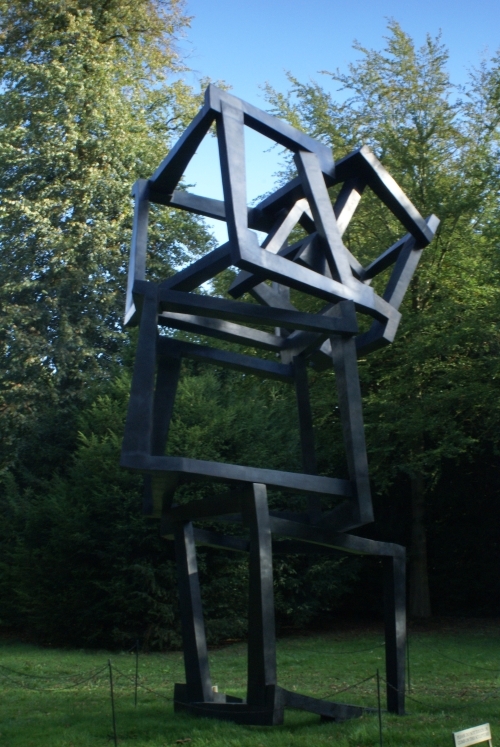 This felt like a much stronger work than Ju Ming’s other sculpture (Number 4 above), which was boosted by the great location. It blended wonderfully well with the surrounding rocks and autumnal colours. Returning to the rockery afterwards, it almost felt as if all of the larger rocks could have been Ju Ming sculptures in their own right. 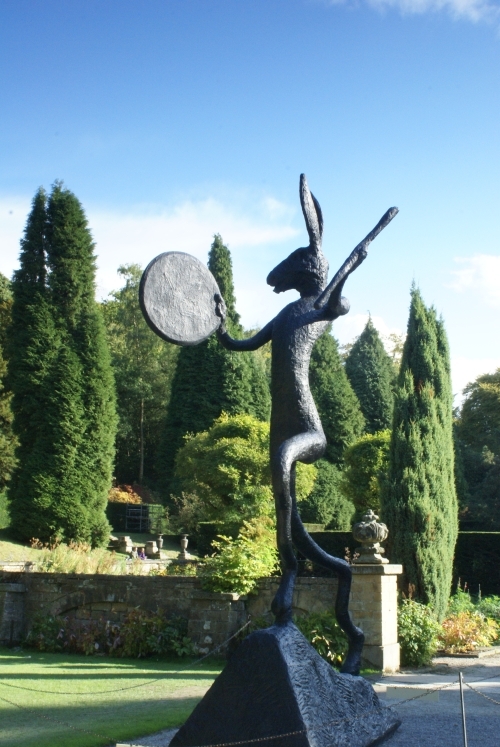 Barry Flanagan’s giant, fantastical hares are great favourites of the Duke and Duchess, and his work also features in their permanent collection. That said, we’re not great fans, and this was our least favourite piece. This “talking” bench would be another great piece to own, if only because it begged to be sat upon! It was fun to trace the extravagantly swooping lines of metal, which swirled from the giant loops at either end and connected directly to the three slats of the bench itself. A typical Jedd Novatt construction – he has also been at Beyond Limits several times before – which was tucked away in a tree-lined enclosure on the North side of the Canal pond. A lengthy discussion was taking place next to us, between a family group who were arguing about the significance of the names of Hirst’s two horses. 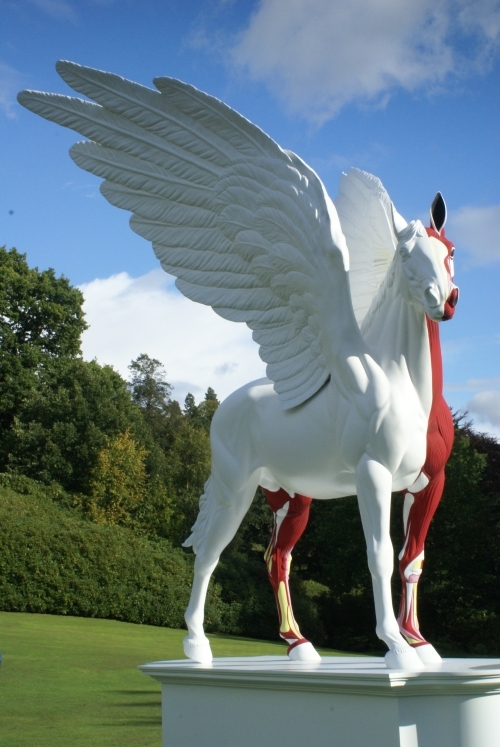 “Legend” is the winged horse, which is most probably a reference to the classical legend of Pegasus – whereas “Myth” is the unicorn, whose existence was believed by many to be true, even as late as the 19th Century. The application of paint on the bronze was so smooth, that the white halves of each creature looked like marble. Nadim Karam was also responsible for the reflective cat at Number 10 above. 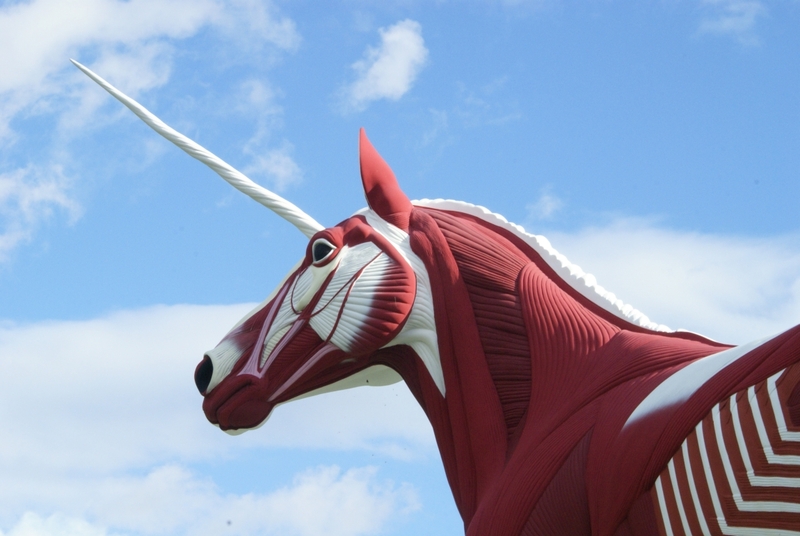 Is this creature a myth, a legend, or just a figment of the sculptor’s imagination? 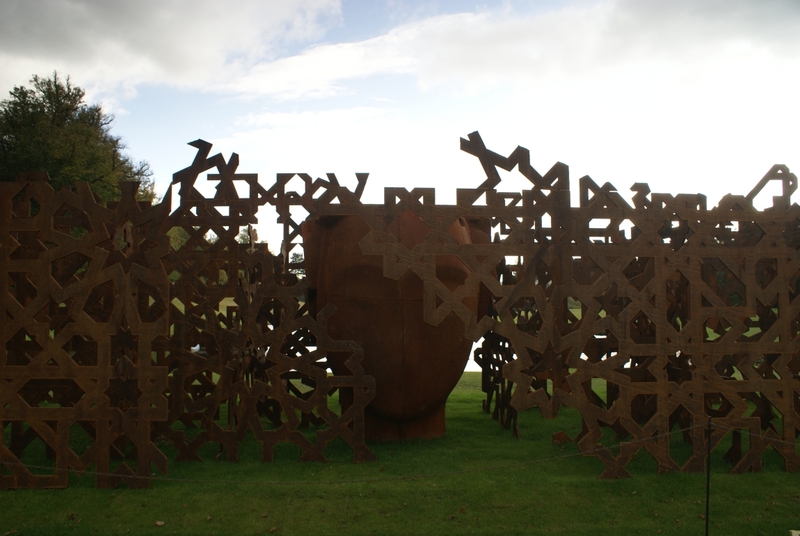 This piece faced the Hirst horses at the other end of the Canal pond, with the central head faced towards the House itself (still under wraps at this end, while refurbishment work takes place on the exterior). It was difficult to appreciate it fully, as there was only a very limited viewing area in front of it, and the clouds were getting darker. 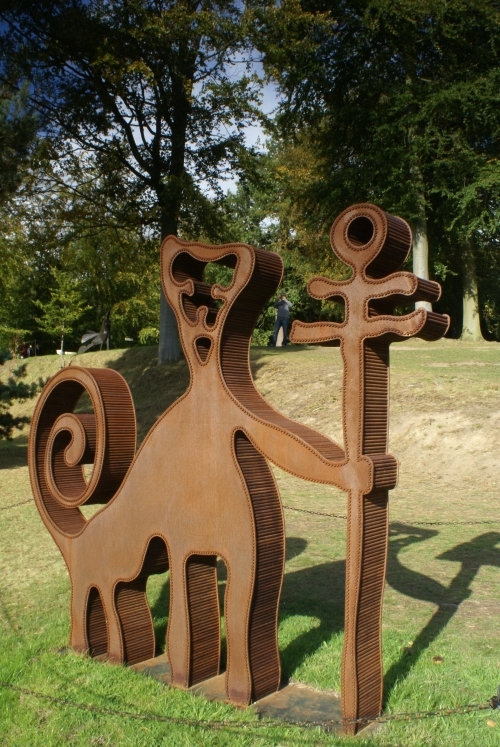 So, which of these sculptures is your favourite? Seriously, this is always an amazing experience even if you are not particularly interested in ‘art’. We always go several times with different friends and we all end up having our own favourites. If you have never been before, try it and you might be pleasantly surprised. – the tea and cakes are really good too! My favourite is the lion, absolutely magnificent. Another year, another great visit. We had an excellent day in the park with my Dutch relatives who jumped at the opportunity to go again, having visited Beyond Limits twice before in previous years. Last time we took my elderly mum, borrowing a wheelchair from Chatsworth. We managed to get round most sculptures with my mum in the wheelchair (in case anyone is considering this for next year – some elbow grease required!). She loved it! This time we took the grandchildren, all little tots, who equally had a whale-of-a-time (or should that be ‘a horse, a lion, a hare or a giant-of-a-time’?!) – who needs a playground? Yes, it’s not cheap, but you can get 10% off by booking on line 24 hrs in advance. I will give the food stalls a miss next time, very limited choice, long queues etc. And my favourite? Other than the beautiful Sentire, I’d give anything for Nadim Karam’s 2 sculptures: Desert Sand and, in particular, Miu whose edges caught the sun resulting in an exquisite illuminous outline of the sculpture. Needless to say that the tots’ favourite sculpture was the lion, having roared back at him as fearsome as they could. I’ll keep on dreaming as they are just a tad ‘beyond my limits’.